Three piece adult costume that includes a jacket, pants, and hat. Available in adult men's plus size. Hat with zebra print trim, jacket with zebra print trim, the pants are a solid purple, and the hat matches the outfit and also has the zebra print around the crown. 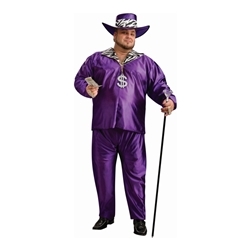 The Big daddy plus size adult costume is a Halloween classic!